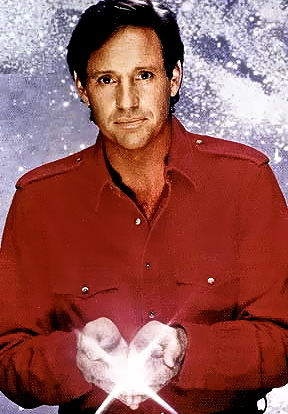 “It takes a long time to raise a kid,” Paul Forrester, a deceased cameraman turned STARMAN says to his son, conceived by that other incarnation played by Jeff Bridges and now morphed into AIRPLANE actor Robert Hays. “About twenty-one years… And I’ve already wasted fourteen of them.” That’s a true description of the show, and a false prediction. 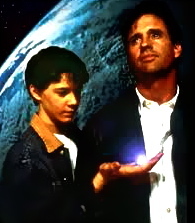 STARMAN the TV series, based on the hit John Carpenter film, didn’t last seven years – it’s a one season wonder about our alien hero traveling around with his son, Scott. Jeff Bridges is an incredible actor, and always takes risks. Yet his performance in the STARMAN motion picture, garnering an Oscar nom, seemed like he was imitating a chicken pretending to be a lizard, or vice versa. While Hays plays it with more subtle finesse, allowing the alien within the human a quicker capability to learn about the things around him – from eating to drinking to hangovers to love, possibly. The stock villain has been around television for years, and looks the part of a sneaky devil you love to hate. Michael Cavanaugh is the McGee to Hays’ David Banner… Or going back further, The Marshall chasing the Fugitive… Not an entirely original premise for a series, but one that allows a handful of adventurous bonding between alien father and half-alien son. Probably the campiest scene, befitting the mid 80’s era, is when Starman puts a cassette tape to his ear, without use of a player, and hears a message from his wife (played by RAIDERS OF THE LOST ARK heroine Karen Allen in the movie). This gives both father and son hope to find her, and a premise for the entire series to rely on. 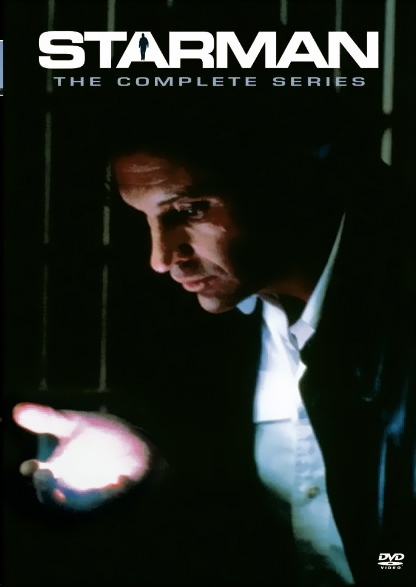 Visually, the direction is standard TV fare but with a few creative perspective shots, while the special effects deal with Starman’s signature handglow when touching the magic orb, wielding power and manipulating elements. This image takes up the entire DVD cover with Hays alone.